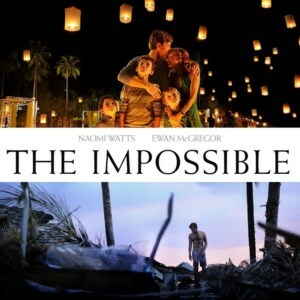 "The Impossible" is a movie base on a true story, of a family of five (mother, father and three boys) on vacation in Thailand when the tsunami struck them while relaxing at the pool of their hotel on December 26. It is a story of how the Bennett family got brutally ripped apart, and how they dealt with the situation no family ever wants to face. If you haven't seen the movie, visit the official movie website to learn more about this film, watch a short trailer, then the full film, and come back and read more so that the movie plot isn't spoiled. Wow, what an amazing story. This name of the movie completely captures the essence of the story, one that even I believed could never happen. And even though I'm sure some aspect of the movie was Hollywood-ified, I still felt the movie was filmed. After some extremely long water scenes near the beginning, every other scene flowed well and were shot in the perfect sequence. The characters portrayed their dire situation well. In the end, I felt like I was in their shoes. My first instinct while watching the film was one of irresponsibly. My goal would be to insure the five and seven year old were safe. How devestating would it have been if Henry had lost his entire family? Thinking more into the situation, the best chance his wife and third child had of being found was actually sooner rather than later. If they were stranded or injured, they would not have survived long without immediate help. Therefore, I have come to agree that spending a couple of days to search for his wife and third child was the right move. Being only recently married a couple of months and still without kids, I reflected on how I would handle myself if I were presented in such a situation. Henry Bennett (the father) had made one very critical decision. Of his three kids, he had recovered two them, the five and seven year old. Should he leave both of his kids with other stranded tourists so he could search for his wife and third child? Or should he make sure his two kids were safe on a plane ride home before resuming the search? After seeing the destruction, the odds of finding survivors alive must have been low. In the end, I had a chance to discuss with my wife what she would want me to do if we were separated and in a situation like the Bennett family, and that only better prepares us if disaster were ever to strike.